Our Omaha deck building company offers many options for decking material; and as winter approaches the durability and low-maintenance needs of using wood-alternative technologies will serve you well through a long, cold Omaha winter. With little-to-no winter prep and no winter maintenance, you can rest easy that a low-maintenance deck from Decks, Decks and More Decks will cause you no extra headache. Depending on your needs and budget, our experienced custom deck experts can advise on decking material, lighting, balusters, rails, benches, etc. Our low-maintenance decking options retain it’s beauty and durability through all seasons. So as winter approaches and the weather begins to shift, Omaha homeowners will not have to be concerned with splintered, warped or faded boards as temperatures freeze and thaw, and moisture begins to collect. Winter can be hard on a deck. Moisture rot can be costly to repair because the damage is typically spread over a larger area and may require foundation repair in addition to surface corrections. 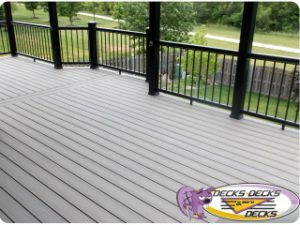 But trusting Decks, Decks and More Decks to build a safe custom deck with quality, low-maintenance materials will give you a long-lasting deck that will easily withstand long, hard Omaha winters. This entry was posted in Custom Decks Omaha and tagged custom decks omaha, deck building omaha, decks omaha on November 20, 2016 by Decks, Decks and More Decks.